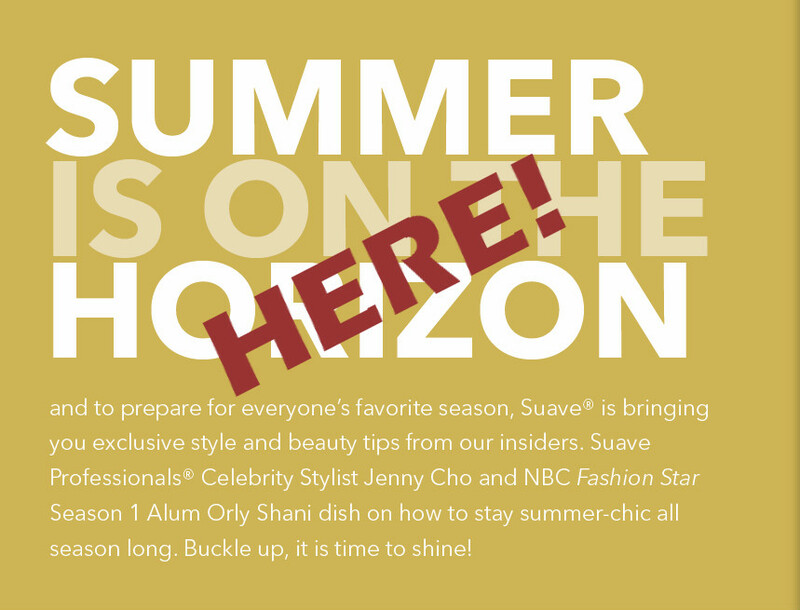 We are smack-dab in the middle of summer and you can stay summer-chic throughout the summer season with these exclusive tips from Suave Professionals Celebrity Stylist Jenny Cho and NBC “Fashion Star” (Season 1) Alum Orly Shani. From brilliantly shiny hair, all-day protection, silky smooth skin and the perfect summer prints, Suave has you covered from head-to-toe. I need to throw in my own two cents here to let you know that I LOVE the Suave Professionals® Moroccan Infusion line to keep my hair in control all summer. (See my Suave Professionals® Moroccan Infusion review HERE!) And I have always found that Suave® Anti-Perspirant/Deodorants keep me the most fresh on hot days – I have used it forever! Reader Giveaway: Anxious to try out some of these fabulous Suave products for yourself? One very lucky Jinxy Beauty reader will win a basket of Suave products to help you stay summer-chic all season long. To enter, just complete the entry form below by 11:59pm on 8/2/13. Good luck! This entry was posted in Giveaway on July 11, 2013 by Chrysa. The infusion! I use the deodorant and it us awesome! I’m most excited to try the Suave Naturals Rainforest Fresh Body Wash! I already use the body wash and deodorant. I am most excited to try the morracan infusion oil. I I LOVE the Suave Professionals® Moroccan Infusion products!!!!!!! I already use the Spray deodorant and love it. I would like to try the Suave Skin Solutions Body lotion with Cocoa Butter. I use the Suave Deodorant. I most want to try the moisturizer with cocoa butter and shea . I love the scent. I tries Suave aloe scent and I love it. I’m most excited to try the deodorant! I would like to try that styling oil for my hair. I can’t wait to try the Suave Deodorant. I’d love to try the Suave Skin Solutions Smoothing with Cocoa Butter & Shea! We use Suave hair products every day. I would love to try the smoothing lotion. I would like to try the Suave Professionals® Moroccan Infusion Shampoo & Conditioner. the styling oil for dry hair looks awesome! I would like to try the rain forest body wash. I use Suave deoderant. Love the scents! The Moroccan Infusion Shampoo and Conditioner is what I would like to try. I already use and love the body wash. I want to try the Rainforest Fresh Body Wash! I already use the Moroccan Infused Styling Oil by Suave, it’s great. I would like to try the Suave Naturals Rainforest Body Wash! I like Suave Professionals® Moroccan Infusion. I want to try the Suave Professionals® Moroccan Infusion Shampoo and Conditioner, thanks! I already use Suave Deoderant (baby powder) I have used it for as long as I can remember. I already use Suave lotions but would love to try the new haircare products. I would like to try the Suave Moroccon Infusion Oil and hope it can smooth by hair. I would love to try the Touchable Finish Lightweight Hold Hairspray! I am most excited to try the Suave Professionals® Moroccan Infusion Shampoo & Conditioner.